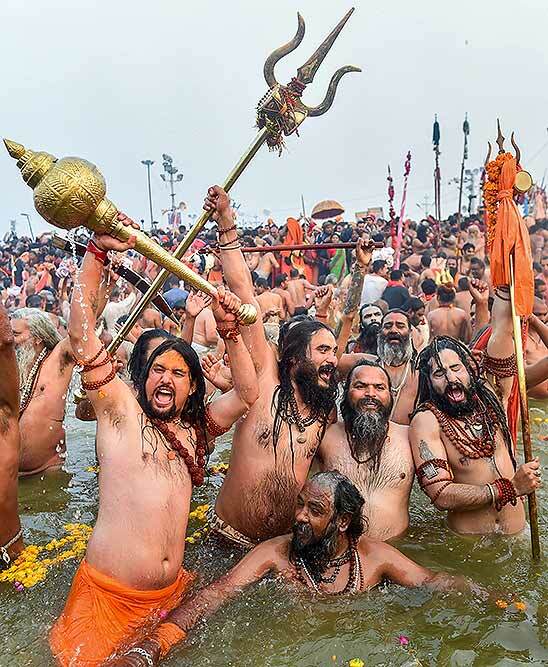 Naga Sadhus take dips at Sangam, the confluence of three sacred rivers the Yamuna, the Ganges and the mythical Saraswati, on Mauni Amavsya or the new moon day, the most auspicious day during the Kumbh Mela or the Pitcher Festival, in Prayagraj. 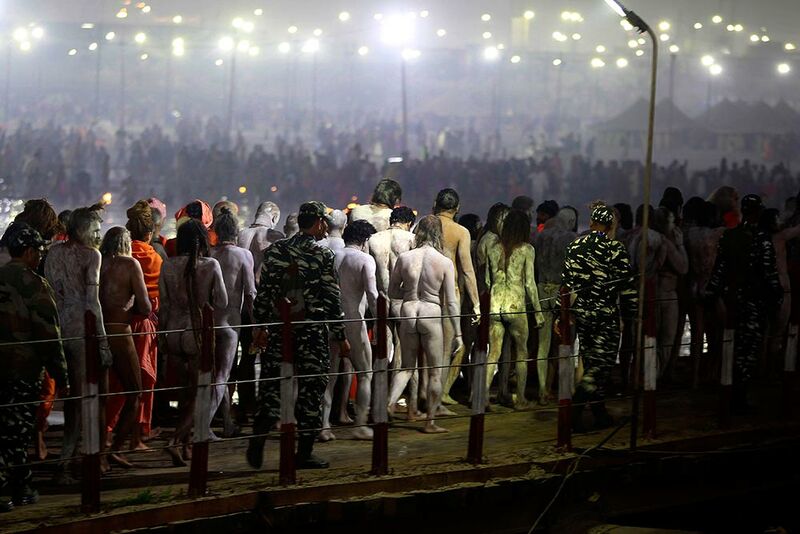 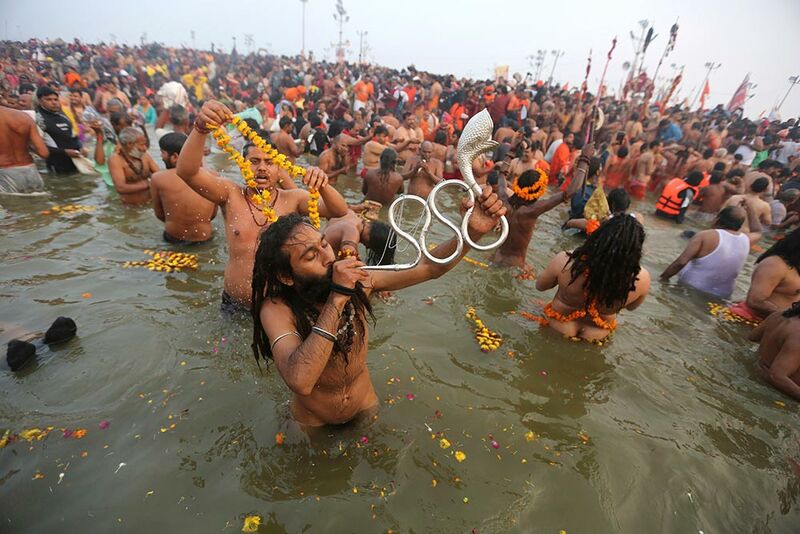 Naked ash-smeared Naga Sadhus arrive for a dip at Sangam, the confluence of three sacred rivers the Yamuna, the Ganges and the mythical Saraswati, on Mauni Amavsya or the new moon day, the most auspicious day during the Kumbh Mela or the Pitcher Festival, in Prayagraj. 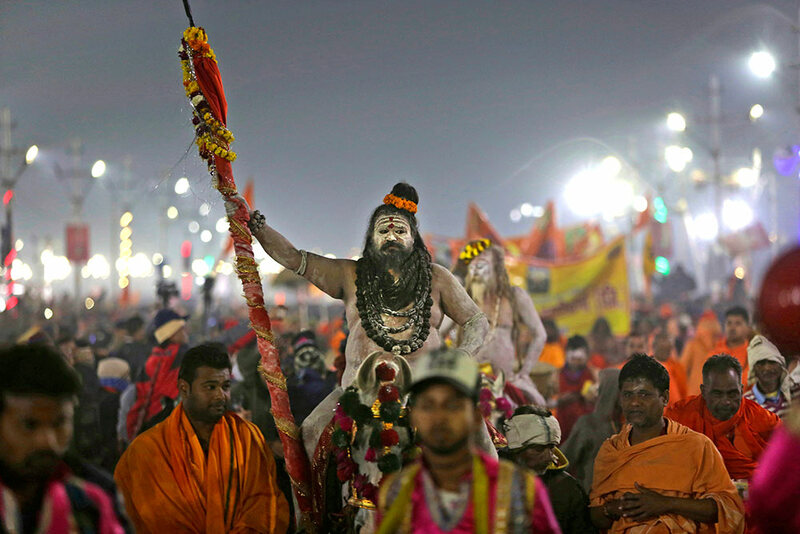 Naga Sadhus leave in a procession to take dips at Sangam, the confluence of three sacred rivers the Yamuna, the Ganges and the mythical Saraswati, on Mauni Amavsya or the new moon day, the most auspicious day during the Kumbh Mela or the Pitcher Festival, in Prayagraj. 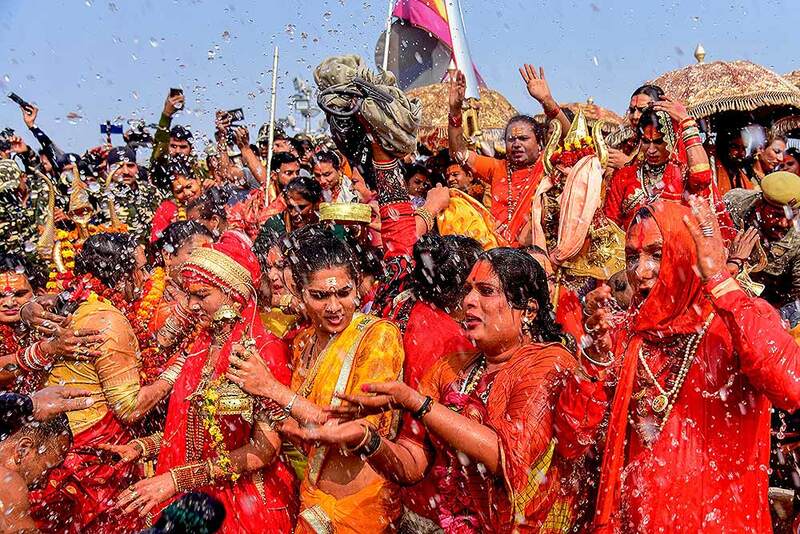 A holy woman blows a conch shell before a holy dip at Sangam, the confluence of three sacred rivers the Yamuna, the Ganges and the mythical Saraswati, on Mauni Amavsya or the new moon day, during the Kumbh Mela or the Pitcher Festival, in Prayagraj. 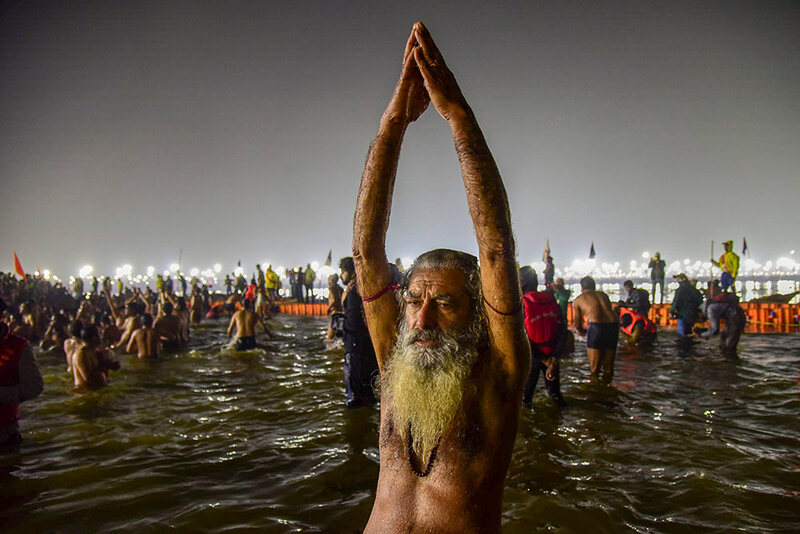 A Sadhu takes a holy dip at Sangam on the auspicious 'Mauni Amavasya' day during the Kumbh Mela, or pitcher festival, in Prayagraj. 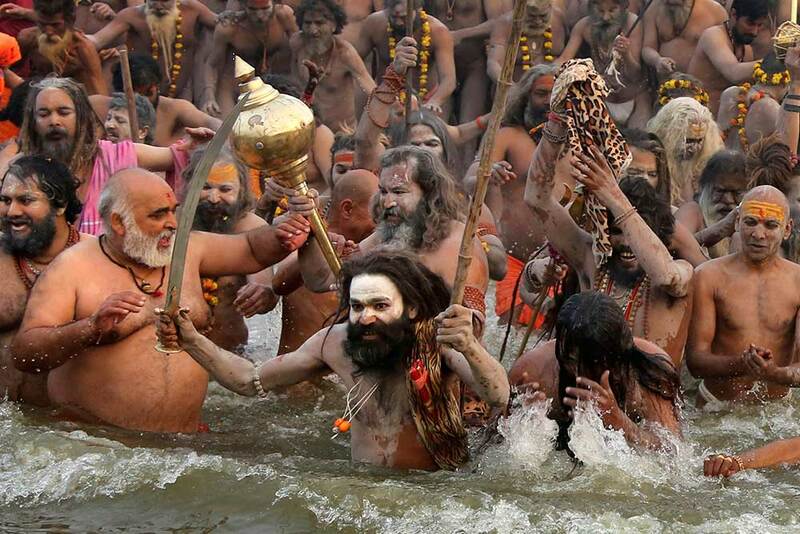 Sadhus arrive to take a holy dip at Sangam on the auspicious 'Mauni Amavasya' day during the Kumbh Mela, or pitcher festival, in Prayagraj. 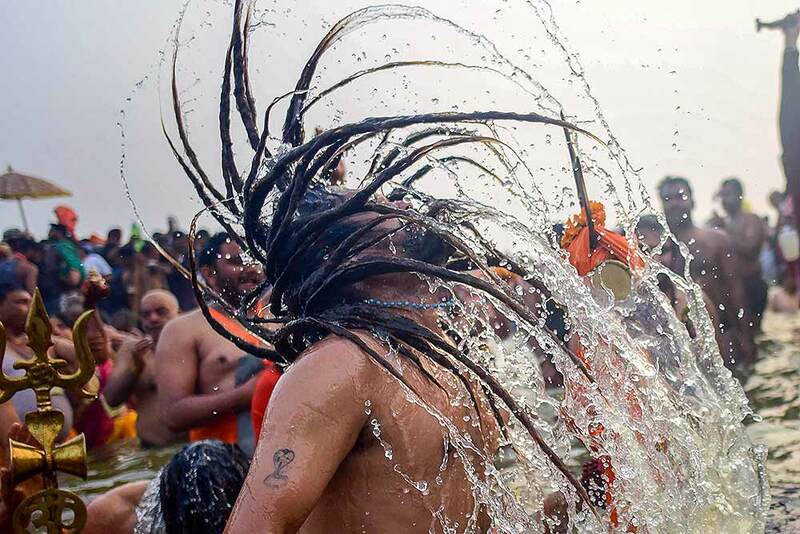 Devotees bathe their Guru at Sangam, the confluence of three sacred rivers the Yamuna, the Ganges and the mythical Saraswati, on Mauni Amavsya or the new moon day, the most auspicious day during the Kumbh Mela or the Pitcher Festival, in Prayagraj. 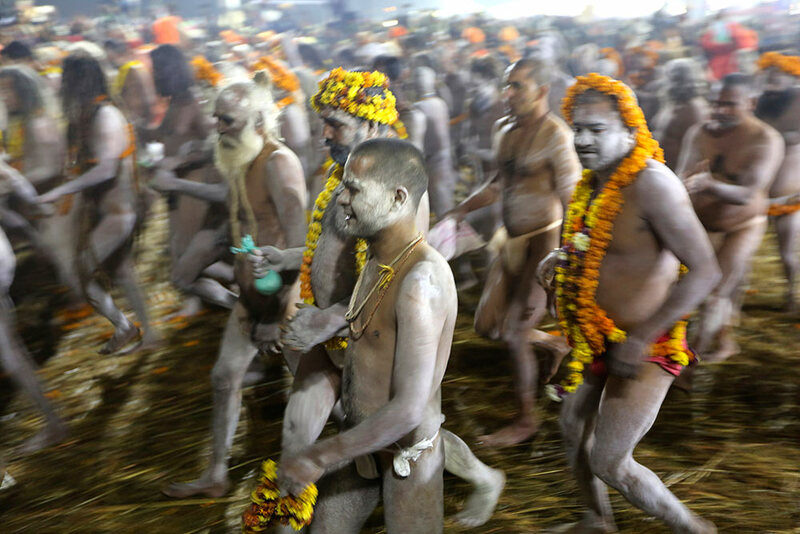 Naked ash-smeared Naga Sadhus run to take a dip at Sangam, the confluence of three sacred rivers the Yamuna, the Ganges and the mythical Saraswati, on Mauni Amavsya or the new moon day, the most auspicious day during the Kumbh Mela or the Pitcher Festival, in Prayagraj, Uttar Pradesh. 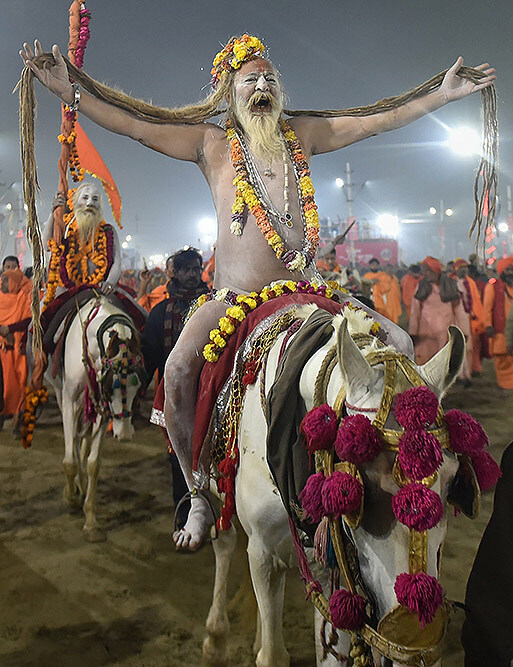 A Naga Sadhu holy man leaves after taking a dip at Sangam, the confluence of three sacred rivers the Yamuna, the Ganges and the mythical Saraswati, on Mauni Amavsya or the new moon day, the most auspicious day during the Kumbh Mela or the Pitcher Festival, in Prayagraj. 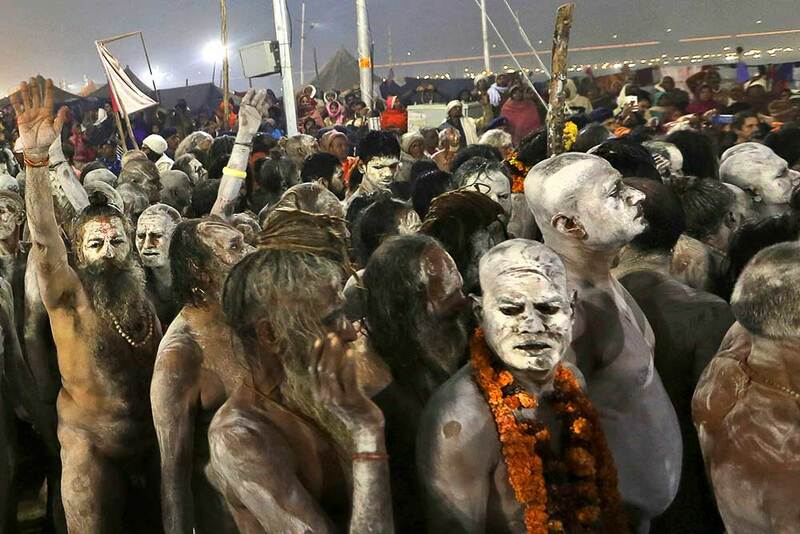 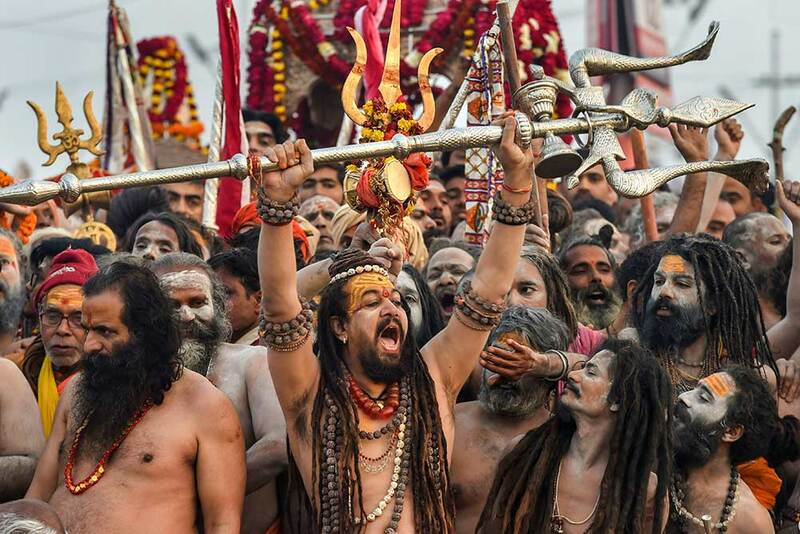 Naked ash-smeared Naga Sadhus return to their camp after taking dip at Sangam, the confluence of three sacred rivers the Yamuna, the Ganges and the mythical Saraswati, on Mauni Amavsya or the new moon day, the most auspicious day during the Kumbh Mela or the Pitcher Festival, in Prayagraj. 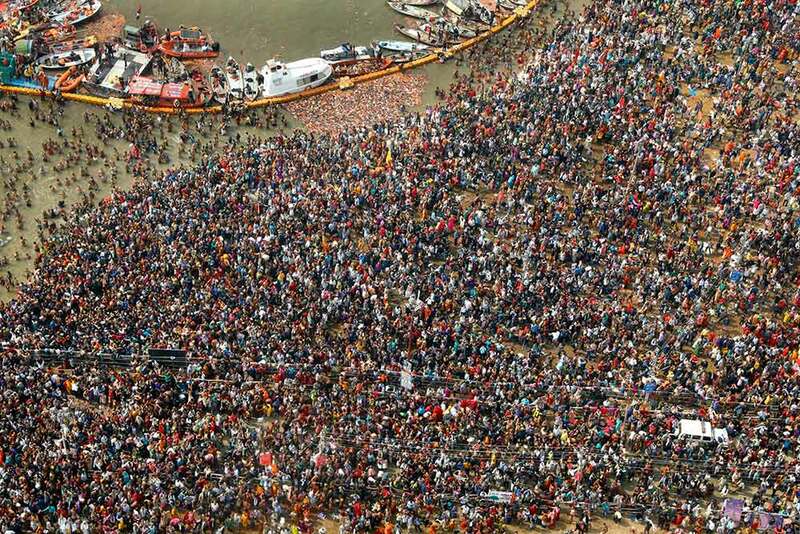 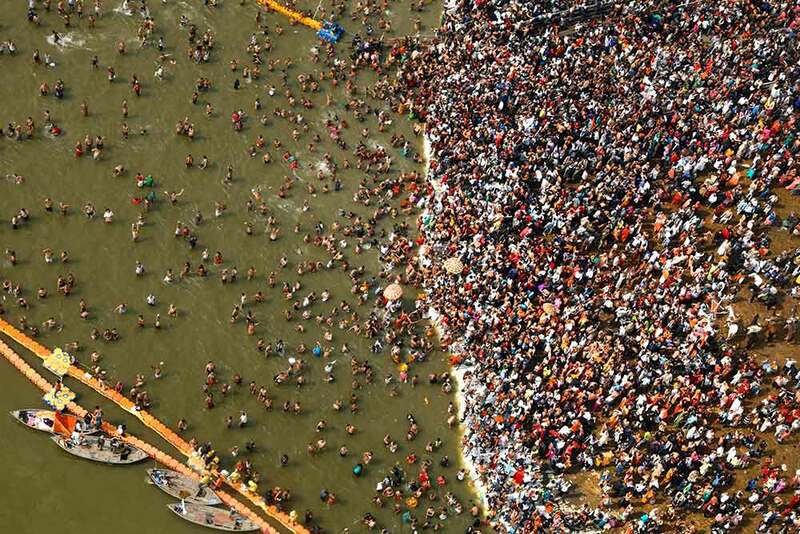 An ariel view from a helicopter is seen as thousands of devotees taking dips at Sangam, the confluence of three sacred rivers the Yamuna, the Ganges and the mythical Saraswati, on Mauni Amavsya or the new moon day, the most auspicious day during the Kumbh Mela or the Pitcher Festival, in Prayagraj. 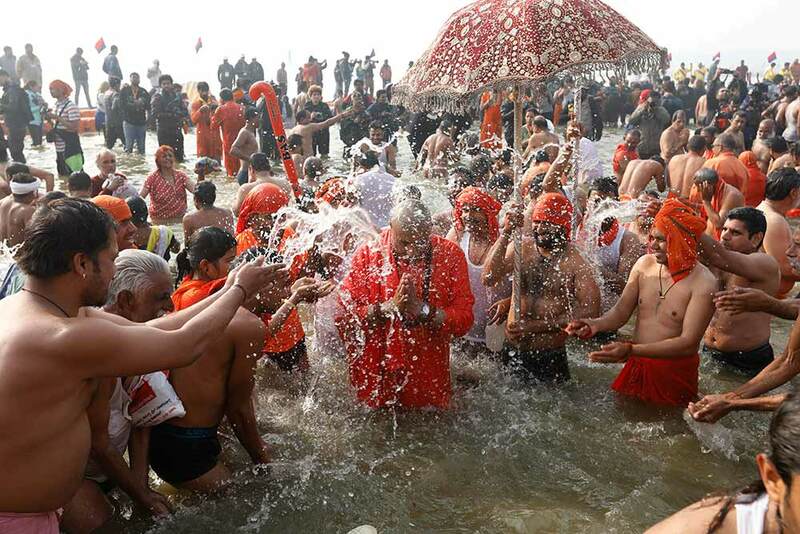 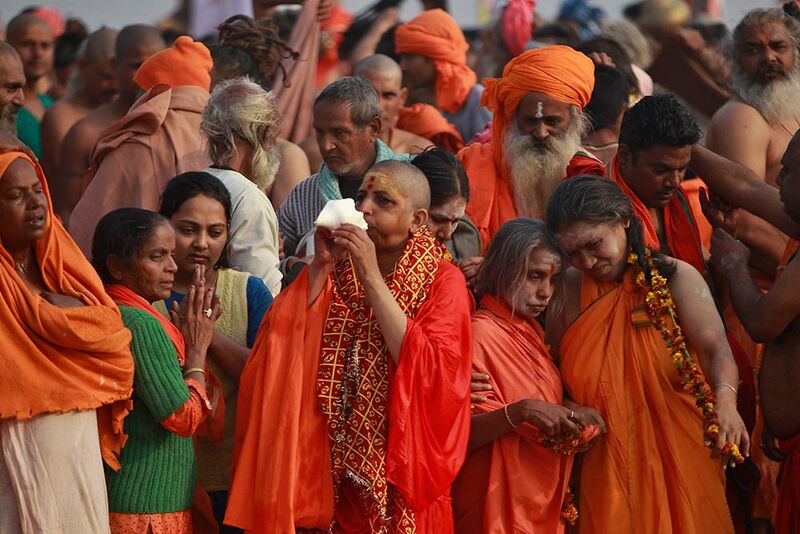 Thousands of devotees take dips at Sangam, the confluence of three sacred rivers the Yamuna, the Ganges and the mythical Saraswati, on Mauni Amavsya or the new moon day, the most auspicious day during the Kumbh Mela or the Pitcher Festival, in Prayagraj. 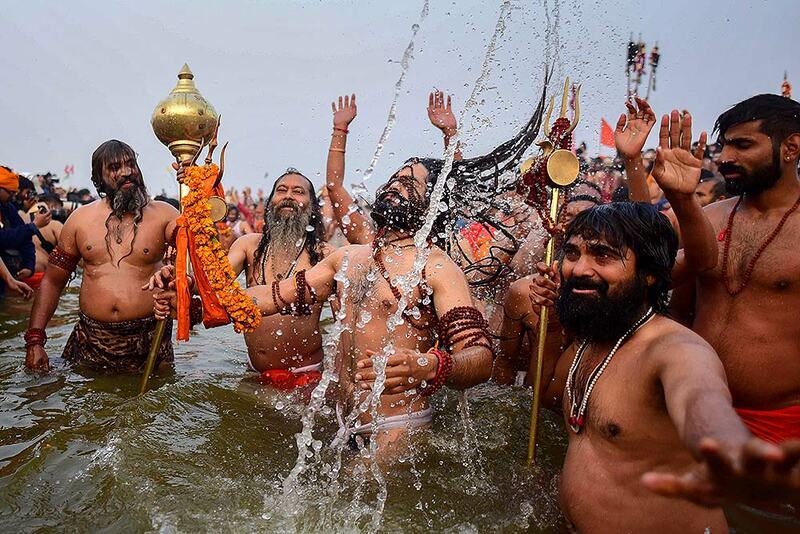 Sadhus take a holy dip at Sangam on the auspicious 'Mauni Amavasya' day during the Kumbh Mela, or pitcher festival, in Prayagraj. 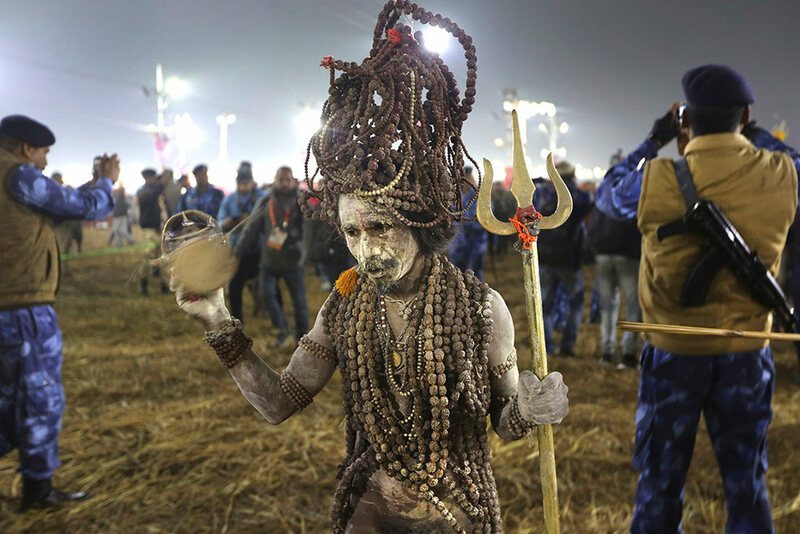 A sadhu holds a trident as he takes a holy dip at Sangam on the auspicious 'Mauni Amavasya' day during the Kumbh Mela, or pitcher festival, in Prayagraj. 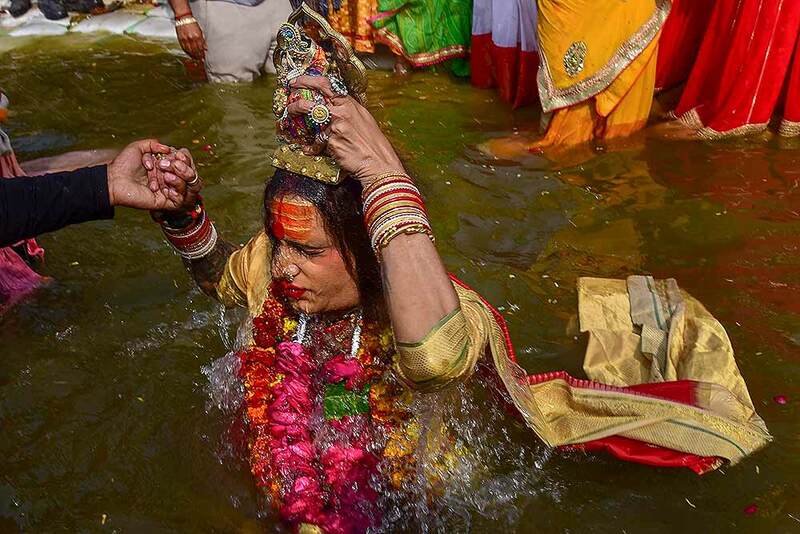 Transgender rights activist and Kinnar Akhada chief Achraya Mahamandaleshwar Laxmi Narayan Tripathi takes a holy dip at Sangam on the auspicious 'Mauni Amavasya' day during the Kumbh Mela, or pitcher festival, in Prayagraj. 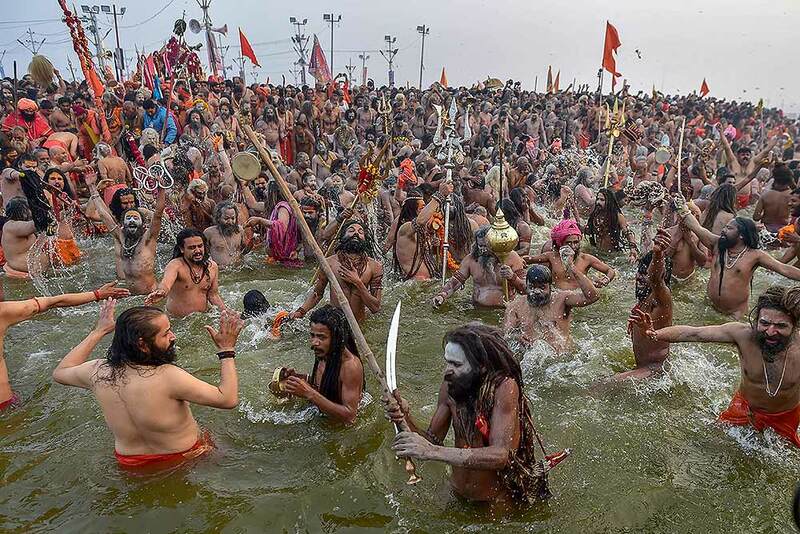 Naga Sadhus take a holy dip at Sangam on the auspicious 'Mauni Amavasya' day during the Kumbh Mela, or pitcher festival, in Prayagraj. 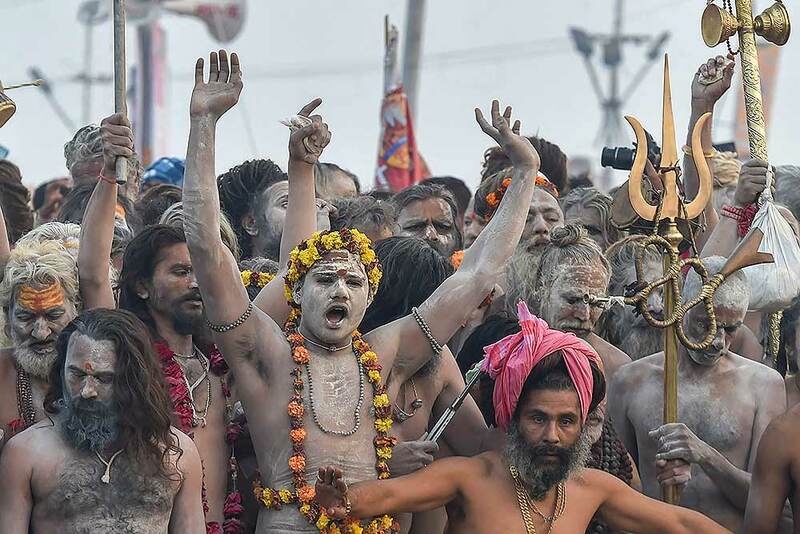 Naga Sadhus arrive to take a holy dip at Sangam on the auspicious 'Mauni Amavasya' day during the Kumbh Mela, or pitcher festival, in Prayagraj. 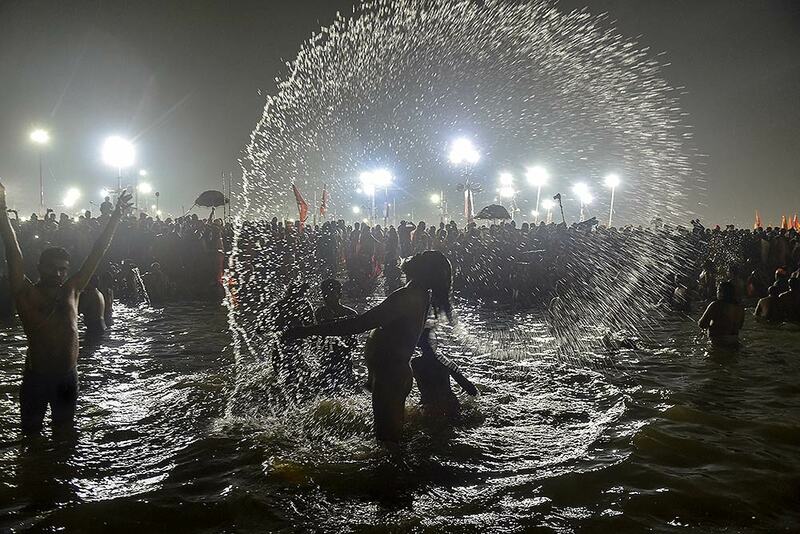 Members of Kinnar Akhara take a holy dip at Sangam on the auspicious 'Mauni Amavasya' day during the Kumbh Mela, or pitcher festival, in Prayagraj. 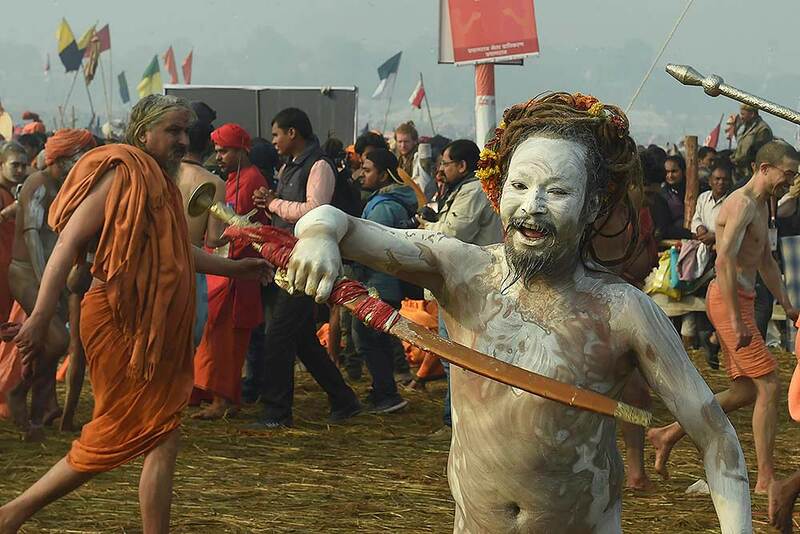 A Naga Sadhu raises religious slogans as he arrives to take a holy dip at Sangam on the auspicious 'Mauni Amavasya' day during the Kumbh Mela, or pitcher festival, in Prayagraj. 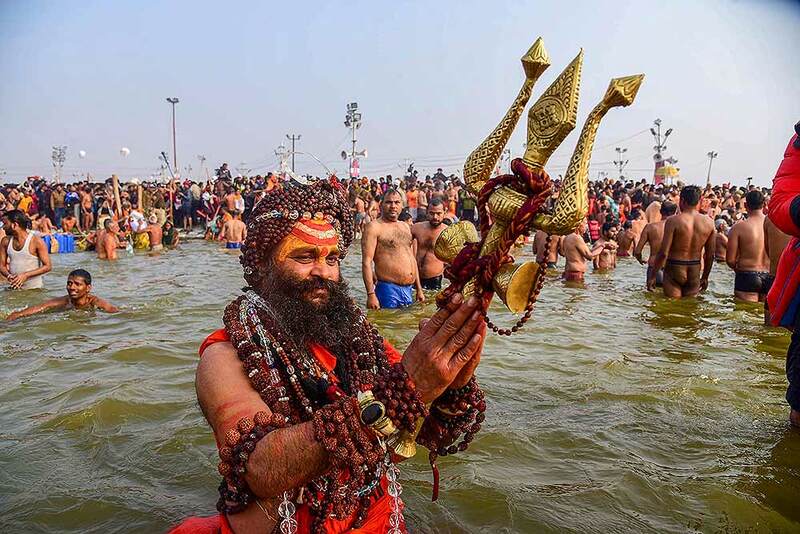 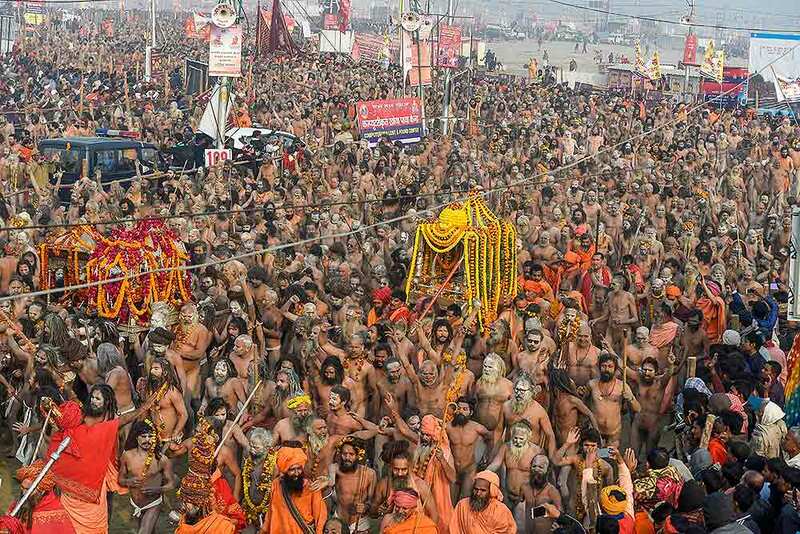 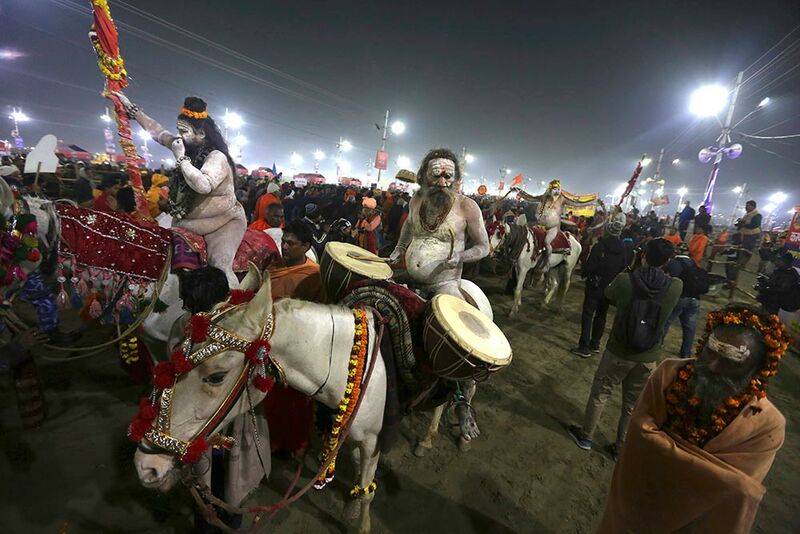 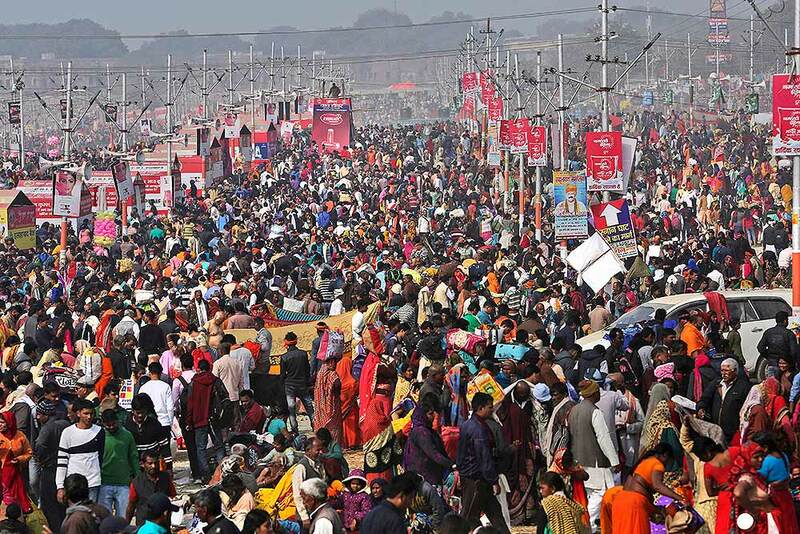 Thousands of Hindu devout arrive to take a dip at Sangam, the confluence of three sacred rivers the Yamuna, the Ganges and the mythical Saraswati, on Mauni Amavsya or the new moon day, the most auspicious day during the Kumbh Mela or the Pitcher Festival, in Prayagraj. 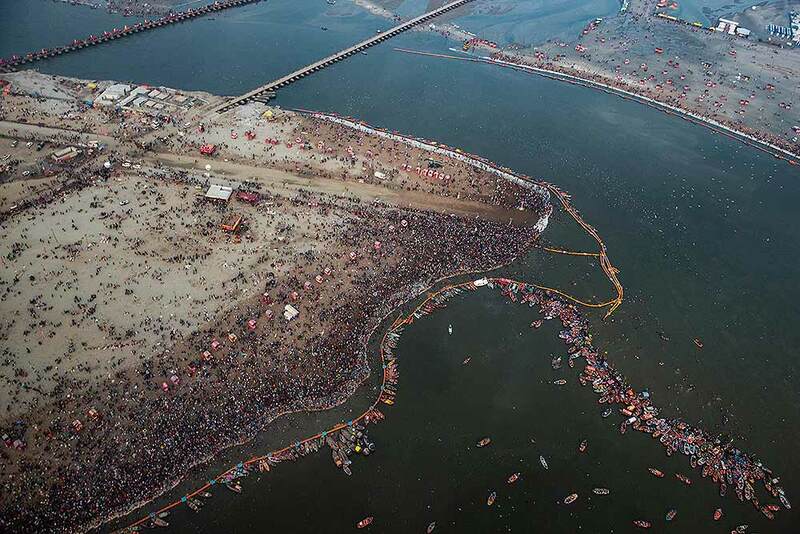 A view of Sangam on the auspicious 'Mauni Amavasya' during the Kumbh Mela 2019, in Prayagraj. 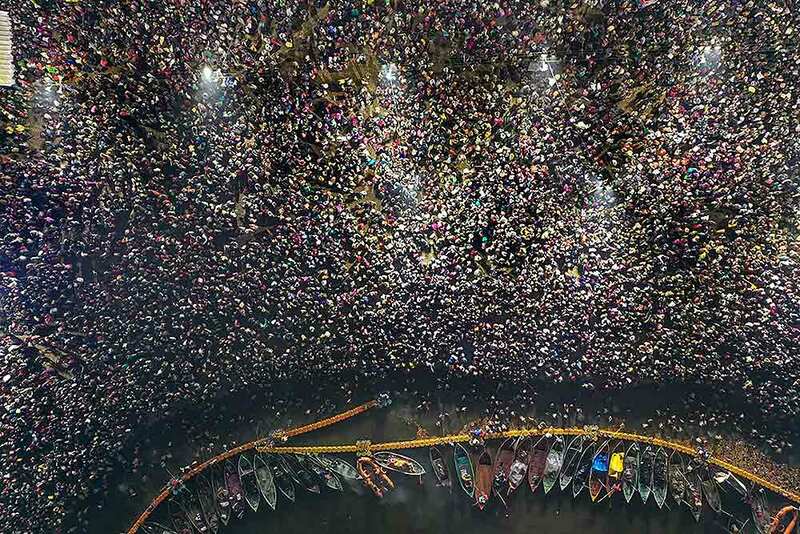 A view of Sangam at early hours on the auspicious 'Mauni Amavasya' during the Kumbh Mela 2019, in Prayagraj.